How can transformed agriculture and food systems in Africa contribute to reaching the SDGs within the planetary boundaries? How do the visions for agriculture and food systems in Africa align to the perspectives expressed in global scenarios? 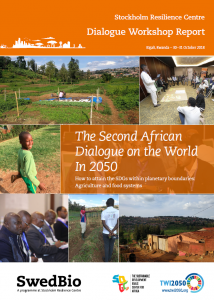 THE SECOND AFRICAN DIALOGUE on The World in 2050 (TWI2050) brought together stakeholders to discuss pathways to reach the UN Sustainable Development Goals (SDGs), within the planetary boundaries, and through the transformation of African agriculture and food systems. The motivation for the discussion is the understanding that for implementing the SDGs it is vital to connect actions across local, national, regional and global levels. The 2nd African Dialogue was planned as a step to contribute to this in the context of the global TWI2050 initiative. The event was held in Kigali, Rwanda in October 2018, and was organised by the SDG Center for Africa in partnership with SwedBio and the Stockholm Resilience Centre.